Christmas is nigh approaching so here is another favorite Cookie for the holidays, The classic, original Chocolate Chip cookie, recommended by Carrie. Preheat oven to 375 degrees F (190 degrees C) with rack in center of oven. Line two baking sheets with parchment paper. Set aside. In the bowl of your electric mixer (or with a hand mixer), cream the butter. Add the white and brown sugars and beat until fluffy (about 2 minutes). Beat in eggs, one at a time, making sure to beat well after each addition. Add the vanilla and beat until incorporated. In a separate bowl, combine flour, baking soda, and salt. Add the dry ingredients to the egg mixture and beat until incorporated, adding the chocolate chips about half way through mixing. If you find the dough very soft, cover and refrigerate until firm (about 30 minutes). Christmas cookies are important facets of the Holiday Season. Not only do they supply delicious supplementation to a Holiday meal, they bring people together in the kitchen and create an activity that can be shared by many. 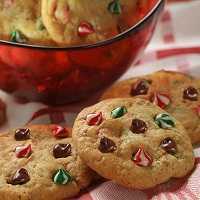 It is in my opinion that there is no official Christmas Cookie, as there shouldn’t be seeing as palates differ from person to person, so I’m asking you to submit, whether in the comments section or via EMAIL, your idea of a perfect Christmas cookie. How far back can the original form of “Christmas” (Christemasse) be traced in our World’s history? The film marked the debut of “White Christmas”, which went on to become one of the biggest selling songs in the history of music.